(Figure 1. The pattern of GBM genesis is similar to that of firework. Like most cancers, glioblastoma is treated with surgery to remove as much of the tumor as possible, then radiation and chemotherapy. However, it almost always returns in less than a year and its median survival time is only 15 months. Precision therapeutic approaches targeting tumors themselves didn’t lead to any breakthroughs. 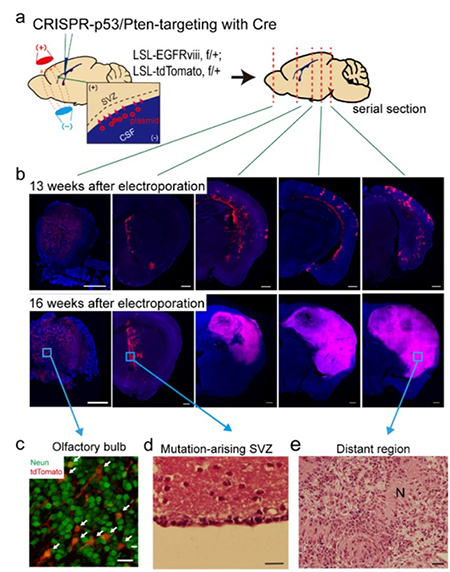 Professor Jeong Ho Lee’s team at the Graduate School of Medical Science and Engineering described direct genetic evidence through the deep sequencing of all triple-matched samples: normal SVZ tissue away from the tumor mass, tumor tissue, and normal cortical tissue. 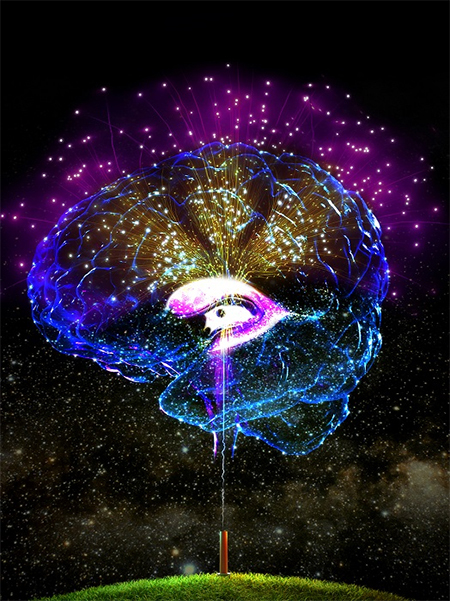 The research team studied 28 patients with glioblastomas and other types of brain tumors who underwent supra-total resection or other surgical resections of tumors, providing access to normal subventricular zone (SVZ) tissue (where neural stem cells are located) away from the tumor mass. The researchers used various deep and single cell sequencing technologies to conduct comparative DNA analysis on the samples from the patient’s SVZ tissue and tumors. Professor Lee has investigated mutations arising in the brain for a decade. He is developing innovative diagnostics and therapeutics for untreatable brain disorders including intractable epilepsy and glioblastoma at a tech-startup, SoVarGen. “All technologies we used during the research were transferred to the company. This research gave us very good momentum to reach the next phase of our startup,” he remarked. Figure 2. 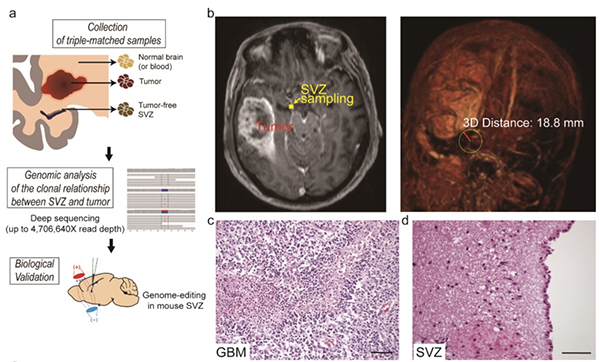 Genetic analysis of tumor-free SVZ tissue and matching tumor tissue from GBM patients.